A clean, fast and flexible Starter Theme for creating beautiful responsive WordPress themes. 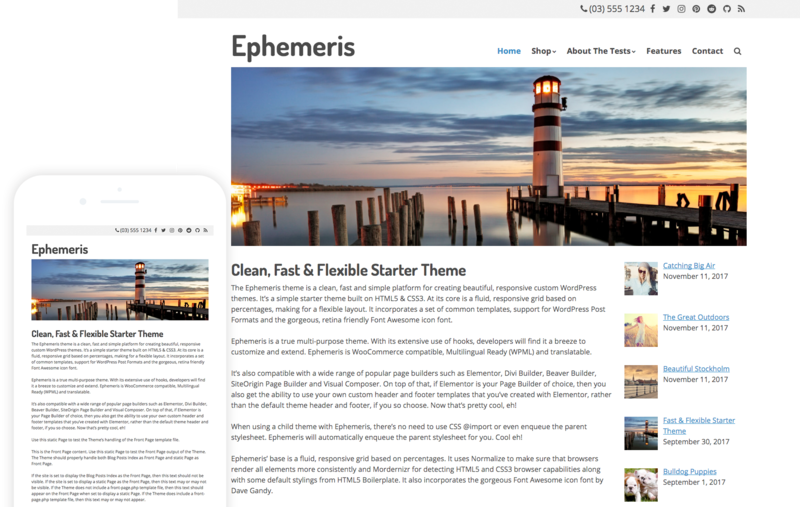 Ephemeris is a simple and elegant starter theme built on HTML5 & CSS3. At its core is a fluid, responsive grid based on percentages. This means not only is it flexible, it’s extremely easy to customise. If you love page builders, then Ephemeris has you covered. Using a selection of Page Templates, the Ephemeris theme works with a wide range of popular page builders such as Elementor, Divi Builder, Beaver Builder, SiteOrigin Page Builder and Visual Composer. Ephemeris also supports the new WordPress Block Editor (Gutenberg). With its extensive use of hooks, developers will find it a breeze to customize and extend. To make this even easier, you can even view a handy visual map of all their locations. At its core is a fluid, responsive grid based on percentages, that's flexible, easy to customise & ensures your site looks great on tablet & Mobile devices. A minimally styled theme, developed with WordPress Best Practices & speed in mind. You'll find Ephemeris super fast and easy to setup & customise. Ephemeris is fully translatable and supports all RTL Languages. It's also Multilingual Ready & fully compatible with WPML. Ephemeris incorporates Schema.org Microdata to help search engines better understand your content by providing rich, extensible markup. Get your eCommerce store up and running quickly & easily with full support for the extremely popular WooCommerce plugin. Fully compatible with major plugins, WooCommerce, WPML, bbPress, all popular Page Builders incl. Elementor, Beaver Builder, Divi Builder & the new WP Block Editor (Gutenberg). Using the WordPress Customizer, with its Live Preview, it's easy to setup & configure all your theme options, including some handy settings for your WooCommerce powered store. Includes 1400+ gorgeous, retina friendly icons. Powered by Font Awesome, these icons are infinitely scalable and extremely easy to style using css. With its extensive use of hooks, developers will find it a breeze to customize and extend. You can even view a handy visual map of all their locations with a simple wp-config define. Subscribe and we’ll let you know when our Pro version is available.